The collaboration with Alibaba’s payment service will enable Chinese tourists to use their Alipay lifestyle app at more merchants across London Chinatown, with newly joined restaurants including “Leong’s Legend” and “Ricecoming”. Chinese visitors will be able to order and pay without the intervention of restaurant staff, by scanning a QR code before paying in Chinese yuan, alongside being served tailored offers when they are in the area. The move marks the first time that this in-app order-and-pay solution will be applied in restaurants outside of China, where the service is already popular with local consumers. Following the initial rollout in London, Alipay plans to apply the service in more restaurants and eateries globally, making it easier for Chinese visitors to dine out when travelling overseas. The smart service is being launched in time for Chinese Golden Week (beginning October 1st) – a seven-day national holiday, in which millions of Chinese tourists are expected to travel abroad, including to the UK. Alipay data shows that spending by Chinese tourists in the UK between June and August 2018 was up 25% from 2017 and a similar spending hike is anticipated for this year’s Golden Week. Alipay is aiming to help retailers and hospitality providers to embrace this lucrative opportunity with services tailored to Chinese travellers. With its central London location and rich heritage, Chinatown is a major stop on their tourist trail. 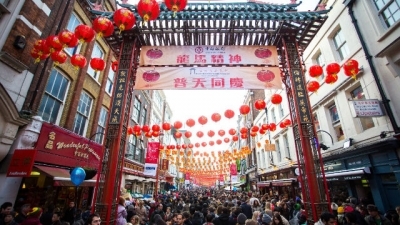 Roland Palmer, head of Alipay, EMEA said: “Chinatown is embracing the influx of Chinese tourists expected to land in the UK in the first week of October, by specifically tailoring its services to meet their needs and expectations. Our mission at Alipay is to make their journeys as seamless as possible from the moment they book their flight, through to their transport, shopping, eating and entertainment during their trip.